CANMORE, ALBERTA—Want to try whitewater rafting, but are a little nervous? The Kananaskis River in Alberta is the perfect river for reluctant rafters! The Kananaskis River offers an excellent introduction for first-timers, but still has enough thrills to keep experienced rafters engaged. This river also makes a great primer for groups and families. Join us as we navigate Class II and III rapids on the Kananaskis in Alberta! Located in the front ranges of the Canadian Rockies, the Kananaskis River crosses the length of Kananaskis Country. 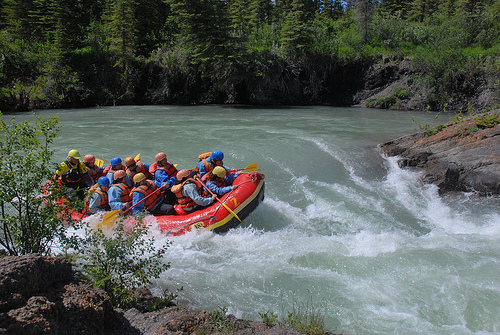 A whitewater rafting adventure here is easily accessible from Banff, Canmore and Calgary. Don’t pack up your paddles as soon as you’re done rafting the Kananaskis. If you’re ready to take on some more serious rapids, head to the Kicking Horse River, or get back on dry land to explore Banff National Park. For more fun-filled Banff activities, including rock climbing, horseback riding, and hiking, check out Banff Travel. Heading to Jasper, Alberta? Don’t miss Jasper Vacations. No matter which tour you book, you’re sure to have a memorable Canadian Rockies vacation. Call 1-888-659-3394 for more information.